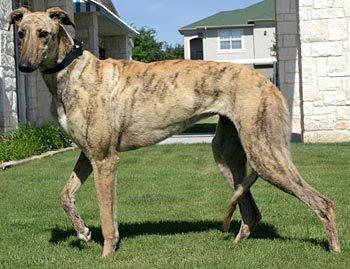 Janis, aka Bayou Hardrock, is a gorgeous, 2-year-old, light brindle female born February 28, 2007. 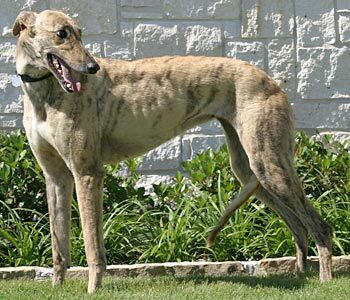 Her sire is Dodgem by Design, making her grand sire the late famous Gable Dodge, and her dam is Keeper Dreamin. 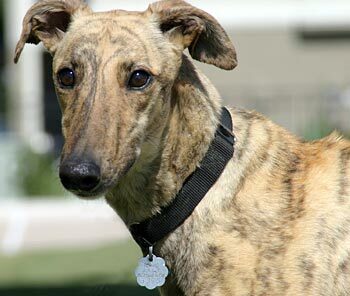 Janis was turned into the Waco Animal Shelter because she would not race. Of course, with a name like Bayou Hardrock, she was named after Janis Joplin! You can see by her posture that Janis’ tail is tucked, and she is a shy girl. 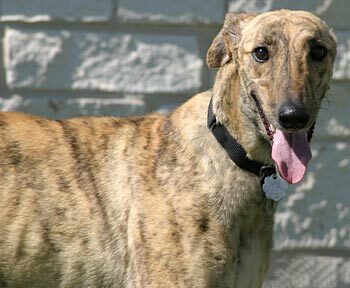 She is making progress everyday, and will make more advances once she is in a foster home and not a boarding facility. Janis’s cat test: Janis has been fostered with cats for three days, at this point. At first, she was very shy and wanted nothing to do with cats, except for a tentative sniff of one she saw in action. Since then she has shown mild interest in the cats. Domino the cat has made it clear he’s had enough with the nose already. She backs off, but does a little tap dance before walking away on her own. 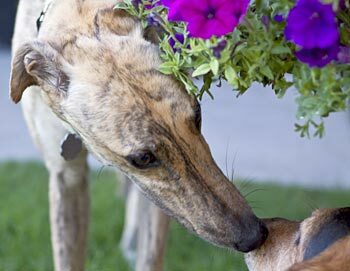 A greyhound’s relationship with a cat indoors and a cat outdoors can be as different as night and day. She shows heightened interest in a cat outdoors, so it would be best not to have them in the back yard at the same time. Close supervision is advised when introducing a new dog to a home with cats.